Sea Watch Foundation » Beluga visits waters of the Thames Estuary! A video of a beluga whale visiting the River Thames off Coalhouse Fort has been reported this morning on Twitter by ecologist and ornithologist Dave Andrews. 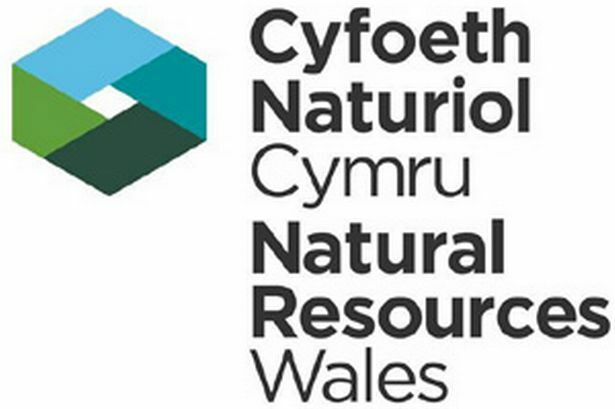 The scientists at Sea Watch Foundation are very pleased to realise how positively the general public responds to this encounter and how much they enjoy getting involved in reporting sightings of whales, dolphins and porpoises around the UK. 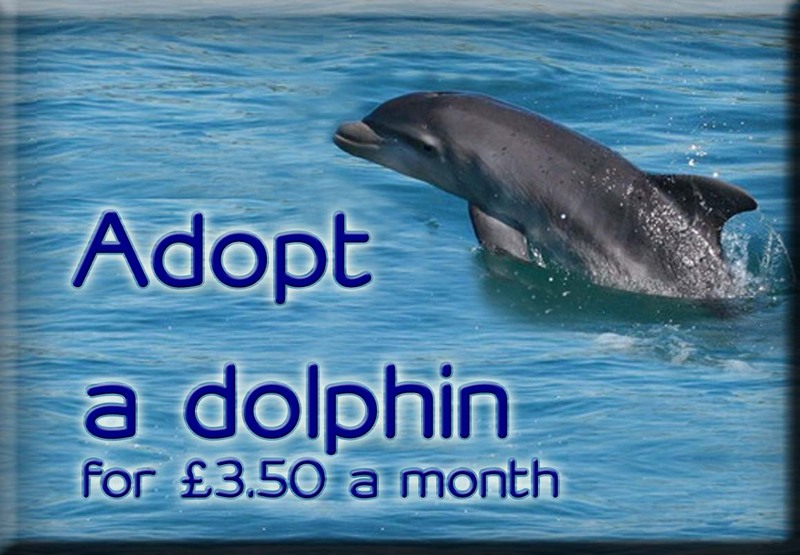 The time and dedication that volunteer sea watchers have spent searching for these species, and the subsequent reporting of sightings have allowed the Sea Watch Foundation to improve the knowledge and understanding about the population status of local cetacean species around the British Isles. The Sea Watch Foundation is very proud of the time, energy and effort that has gone into reporting public sightings spanning over four decades which are the backbone of their national database. The beluga whale, Delphinapterus leucas, is a medium-sized cetacean (up to 5.5m in length) lacking a dorsal fin and with a uniform white body colour, although the latter is only achieved in adulthood. It has a stout body with a small head and pronounced melon. The most distinctive features which are used to identify beluga whales are the white colouration, the bulbous head and the lack of dorsal fin. The beluga whale was reported at around 11:00 am this morning swimming close to the edge of the river, possibly feeding in the area. The animal was sighted east of Gravesend and west of Coalhouse Fort, closest to the Kent side. 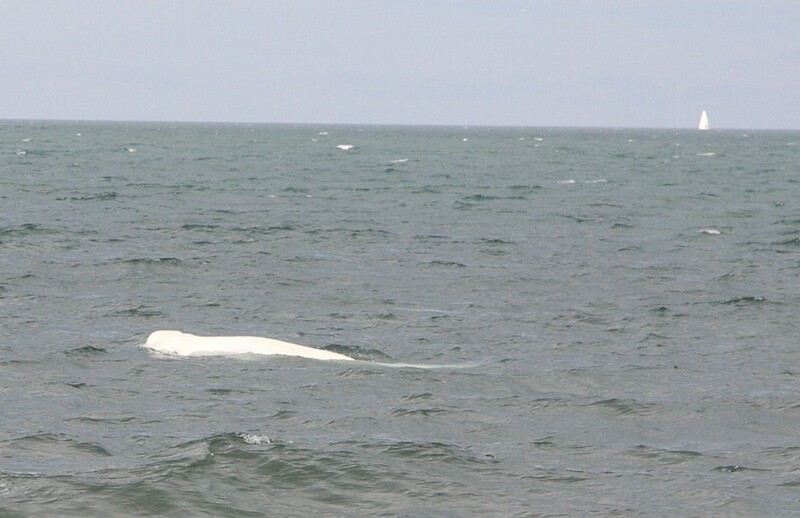 Beluga whale (Delphinapterus leucas) showing the white colouration of the skin, a bulbous head and the lack of dorsal fin. 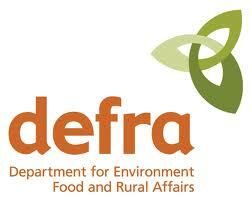 The beluga or white whale has been sighted in UK waters before in recent years. This species was sighted 17 times before this one in all of Britain and Ireland (ten in the last thirty years). There are just two records from the Republic of Ireland – one off Clare Island, Co. Mayo in 1948 and another at Cobh, Co. Cork in 1988. Thirteen of the seventeen records come from Scotland. 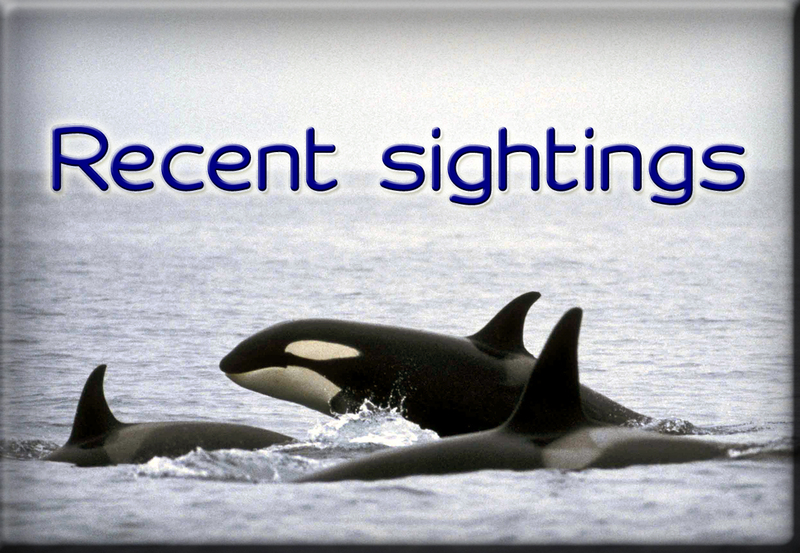 Most sightings have been made between June and September. This species was also sighted on July 30th, 2015, during the Sea Watch Foundation’s National Whale and Dolphin Watch, a 9-day annual event which involves thousands of volunteers from all around the British Isles in collecting sightings of cetaceans from land and from the sea. Two beluga whale sightings were recorded off Dunseverick in Northern Ireland. It was assumed that the same animal was observed on two separate days. 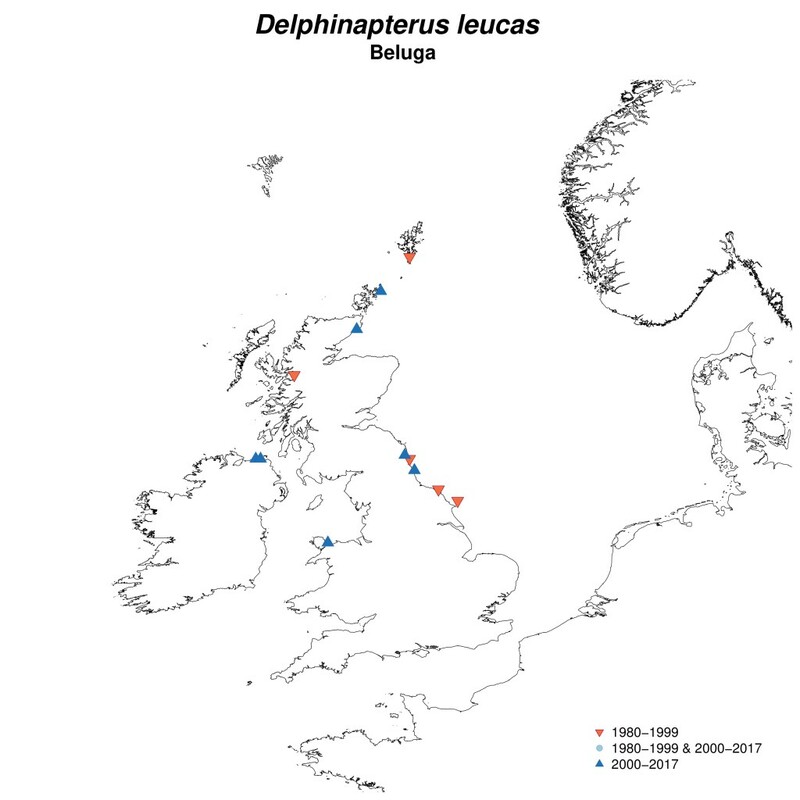 Map showing Beluga whale sightings in the UK over the past fifty years (Source: Sea Watch Foundation). “In the last decade, we have recorded sightings of cetacean species that are completely outside of their normal habitat, like the bowhead whale – a species which is largely confined to the Arctic regions – which was sighted off the Isles of Scilly in Feb 2015”, comments Dr Chiara G. Bertulli, Sightings Officer at the Sea Watch Foundation. Belugas have a circumpolar arctic distribution. In the North Atlantic, the main populations occur off NE Canada south to the Gulf of St Lawrence, around the coasts of Greenland (mainly in Baffin Bay), and in the Barents Sea including around Svalbard. In NW Europe, the species may wander southwards west of Norway, with records from southern Scandinavia, the Baltic and North Seas (Denmark, Sweden, Finland, Lithuania, Poland, Germany, the Netherlands and Belgium), and no more than a dozen records, mainly sightings, from the British Isles, for the most part in the central and northern North Sea along the east coast of Britain between July and September. The beluga has an arctic distribution, normally occurring at or near the ice-edge, its seasonal movements largely dictated by the annual sea-ice cycle. The beluga is the only medium-sized cetacean (up to 5.5m in length) lacking a dorsal fin and with a uniform white body colour, although the latter is only achieved in adulthood. It is unique among cetaceans in having all, or almost all, of the neck vertebrae unfused giving the neck great flexibility. It has a stout body with a small head and pronounced melon. The head has a slight beak, and looks unusually small compared with the body due to the great thickness of blubber covering the thorax and abdomen. The melon is bulbous and malleable. The skin is soft, often with small transverse ridges, and frequently scarred. Adults are pure white or (in early summer) yellowish whereas calves are grey or grey-brown, and often blotched. Juveniles become progressively lighter with age, although females often are still light grey at sexual maturity. The flippers are short and rounded, progressively turned up at their tips in adulthood. The tail fluke is deeply notched and also changes shape with age, developing a lobe on each side of the trailing edge. A distinct ridge takes the place of a dorsal fin. Martin, A.R. and Evans, P.G.H. (2008) Beluga Delphinapterus leucas. Pp. 700-702. In: Mammals of the British Isles. (Eds. S. Harris & D.W. Yalden). Handbook. 4th Edition. The Mammal Society, Southampton. 800pp.